The French sub-Antarctic islands are, due to their remoteness from centers of human activity, sanctuaries for wildlife. The biological heritage still almost intact of these oceanic islands is rich and of considerable importance. The desire to protect the French Southern Territories is old. 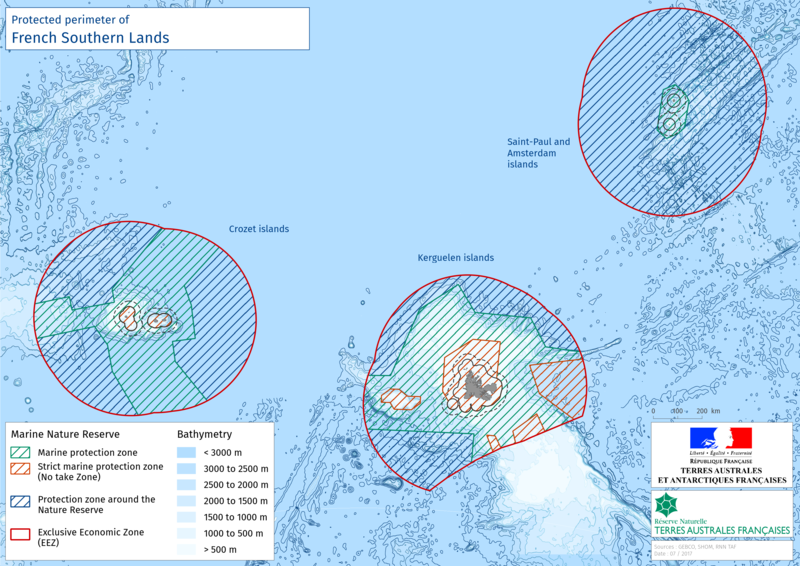 In 1995, the Committee of the polar environment emphasizes the uniqueness of the natural heritage of the French sub-Antarctic islands and recommends the protection of terrestrial and marine nature reserve of the three sub-Antarctic islands. At the request of the scientific community, a first proposal ranking is drawn up in 1996. After 10 years of education, an inter-ministerial decree signed October 3, 2006 class Crozet archipelago, Kerguelen archipelago, Amsterdam and St. Paul islands and part of their territorial waters in national nature reserve. With a land area around 7 700 km² and a marine area of 15 700km² - including internal waters and parts of territorial sea - is by far the largest nature reserve of France. Within the first reserve management plan, it is proposed to evaluate the relevance of the marine scope and offer if necessary, an expansion of the classified area. Thanks to the close cooperation with the scientific community and in accordance with France's commitments taken at COP 21, the community TAAF offers, thanks to the Biodiversity Law adopted in 2016, a marine extension of 672 969 km². On 12 December 2016, the inter-ministerial decree on the extension of the reserve on the area proposed by the Manager is published. This classification covers all land and marine conservation issues of territory, including the essential functional areas of marine species. To preserve the marine areas of high ecological importance, "no-take" zones were set up, covering a strict protection area of more than 120 000 square kilometers. The industrial and commercial activities, including commercial and recreational fishing are prohibited. With this new scope, the reserve is one of the largest marine protected areas on the planet. The main purpose of the reserve is the protection implementation and management of natural areas for the maintenance of global biodiversity Southern Territories. The TAAF is the designated organization to ensure the management of the Reserve, with the Prefet of TAAF who serves as Reserve manager. The TAAF Advisory Council serves as an advisory management committee to the nature reserve and the Committee of the polar environment delivers scientific advice. The national nature reserve of the French Southern Territories (RNN161) is a national nature reserve protecting all land territory and part of the marine space of three districts subantarctic the French Southern and Antarctic Lands , that is, ie the Crozet islands , the Kerguelen islands and St. Paul and New Amsterdam islands . created in October 2006 It protects 700,000 hectares of land and 66,596,900 hectares at sea, for a total area of 67,296,900 hectares (672,969 km²). This makes it by far the largest nature reserve of France 2 . Its main objective is the effective protection and management of natural areas concerned in order to maintain biodiversity overall the Southern Territories, including ensuring the protection of cetaceans , since it is located within the southern sanctuary to them dedicated. The French sub-Antarctic islands are, by their remoteness from any center of human activities, unique refuges for wildlife. Their oceanic biological heritage is still almost intact and is to be both rich and of considerable importance 3 . In December 2016, the perimeter of the reserve was extended to more than 600 000 km 4 .
fishing info: No bottom trawling or directed shark fishing allowed.